Home » Factoids » Does Your Computer Need a Tune Up? Does Your Computer Need a Tune Up? Do you need a computer tune up?? You take your car in for an oil change every 3000 miles, have its tires rotated and get the engine tuned up from time to time. Yet while we all make sure to maintain our vehicles, most of us don’t bother to perform similar tasks on our personal computers, even though we may spend more time in front of our PCs than we do in our cars. Let’s face it; more and more our lives are dominated by computers. Studies show that more and more people spend time on a computer than time spent doing anything else apart from sleeping. If you think about it, it is completely true. Think of all of the hours spent at work at a computer. Think of all of the time you spend at home in the evenings and weekend on a computer, checking your e-mail, watching online videos or chatting with friends. What is a computer tune up? Well, it is a pretty broad term for any number of things that will help insure that your computer is performing at the ability that it should be performing at. 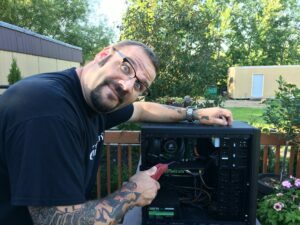 The Northwoods Computer Guy can get your computer up and running quick again in only a few hours! Just as you cannot put a price on your own health, don’t put too low a price on your computer’s health. A computer tune up can really keep your computer working – and your life in order.